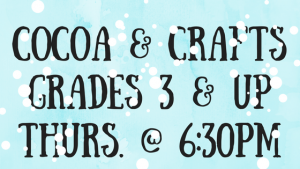 Kids in grades 3 and up can join Miss Alex Thursday evenings in the month of December to make some crafts and share some cocoa! Registration required, you will have an option to indicate which weeks you want to attend. Registration opens 11/15. Meets: 11/29, 12/6, 12/20, 12/27.